Hurricane Katrina struck the Gulf Coast in late August 2005 causing extraordinary damage to the communications facilities in the region. In January 2006 Chairman Martin established an Independent Panel (the “Katrina Panel”) to study the impact of the hurricane on all sectors of the telecommunications and media industries and to make recommendations concerning ways to improve disaster preparedness with particular emphasis on the communications facilities available to first responders such as police, fire fighters and emergency medical personnel. The Katrina Panel issued its Report and Recommendations to the Commission (the “Report”) on June 12, 2006. In its report, the Panel found paging systems “more reliable” during the disaster than voice/cellular systems.2 In view of this finding, the Commission initiated this proceeding to address and implement the Panel’s recommendations and, to this end, the Commission has solicited public comments concerning what actions it can take to address the Katrina Panel’s recommendations and the following comments are in response to that solicitation. The ability for users to “roam” from private to public systems. Pursuant to its review, the Panel recommended paging technology as an alternate communications channel for organizations to use in contacting their “key players” during emergencies and as an “effective back-up” solution for existing public safety communications systems. We commend the Panel for its diligent and thorough review of the impact of Hurricane Katrina, and we are in general agreement with its findings and recommendations. The ability for system administrators to control the use of the system during emergencies. Accordingly, while subscription to carrier provided public services could, in certain cases, provide the two-way paging communications required by first responder organizations, there would be instances where a dedicated system operated by a public safety entity is absolutely required. Two-way paging has demonstrated compelling benefits in terms of functionality, geographic coverage, in-building penetration, and the ability to support reliable delivery in difficult environments. It is positioned to be extremely helpful to emergency personnel for public safety and other homeland security applications through its wireless instant messaging, broadcast messaging, e-mail, and location-based capabilities. The inherent strengths of two-way paging features and functionality can provide an excellent means of communication as a primary or backup system for emergency personnel and homeland security. Similarly, the beneficial characteristics of one-way paging technology would be advantageous in the Emergency Alerting System (EAS) that the Commission is currently reviewing. It is our firm belief that Paging is the BEST technology to use when it is necessary to alert many people in a short time. Because of "group call" a feature of paging that allows us to alert almost an unlimited number of people with one single radio transmission (to a common capcode). For example, with paging technology a message can be sent to over a million people in the time it takes to make two or three telephone calls. Because of “simulcasting” a feature of Paging that allows the same radio message to be broadcast over multiple transmitters simultaneously — (simultaneous + broadcast = simulcast) meaning that a radio Paging signal generally has much better penetration into, under, and around buildings and is less likely to be blocked by obstructions since it will be coming to the Pager from several different directions at the same time. Because of the fact that Paging systems cost a fraction of other technologies like cell phone systems. Because most Paging transmitters are individually controlled over satellite links and they do not need a physical landline running back to the control point (like the fiber-optic networks used in cellular systems). Because Paging is a mature technology. It has been refined and perfected over many years and it works very well. It is here today and available to be used RIGHT NOW! We can use a proven technology that is already deployed coast-to-coast. One-way paging is by far the fastest, least costly, and most reliable way that we have to warn millions of people about impending danger. We know that no telephone—neither cellular nor wireline—will work when everyone tries to use them at the same time. We also know that one-way radio paging systems work very well when it is necessary to send a message to everyone on the system at the same time. Technically, we call it “group call to a common capcode.” It's easy for one-way paging. No other technology can do that. Traditional broadcast radio and television come the closest, but their ability to network and cover the whole country is limited, complex, and costly. Even “reverse-911” systems, that claim to be able to call out from a 911 call center to alert everyone in a given area using regular telephones, make no sense when it is necessary to notify over one million people in one minute. Paging can do it while other technologies are still thinking about it. The Commission should permit private two-way paging systems to be licensed by public safety community in the 896-901/935-940 MHz band. The Commission should work with public safety community organizations to develop and implement practices for disaster preparedness and these practices should include paging. 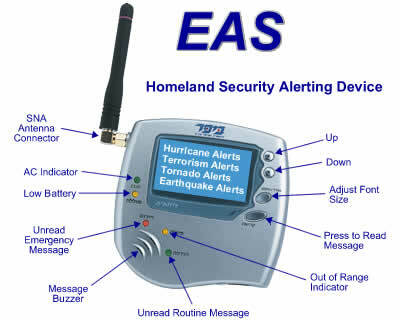 The Commission should incorporate paging technology into the EAS. Brad Dye and Ron Mercer stand ready to assist the Commission in any way deemed necessary. 1 Notice of Proposed Rulemaking, EB Docket. No. 06-119, 71 Fed. Reg. 38564 (July 7, 2006) (Notice). 3 Please refer to reference appendix. “Message to the Wireless Messaging Newsletter” from Carter C. Blumeyer, Communication Specialist, FEMA Urban Search and Rescue, August 30, 2005 2:49:53 PM CDT. Application of County of Monroe, New York to Operate a Public Safety Talkback Paging System on 900 MHz Frequencies in Rochester, New York, File No. 0001897038. Waiver request filed by the City of Richmond, Virginia, which seeks to operate a regional public safety two-way paging system on 900 MHz band Narrowband PCS (NPCS) Channel 16 (frequencies 930.65 - 930.70 MHz and 901.8125 - 901.8250 MHz). AAPC/USA Mobility, September 23, 2005. ReFLEX is a registered trademark of Motorola, Inc.
alerting device like the one being used in Israel.